She had complained of dizziness that day, and some subtle shaking of her left upper extremity. Mom and patient were not initially concerned since the patient had been known to have shaking of her legs at baseline. After returning home from her appointment, the patient fell asleep on the couch and did not awaken for the remainder of the evening. On the morning of presentation, mom reports that she was still unable to awaken the patient. The patient was very weak and had difficulty bearing her own weight. Her speech was noted to be slurred and largely unintelligible. Mom also reported the patient had a fall at school about a week prior in which she hit her head against a locker. There was no loss of consciousness at the time, and aside from a headache, the patient had been in her usual state of health. She had been feeling well and had a good appetite without any nausea or vomiting. She had been afebrile. There was no significant cough, congestion or respiratory difficulties. PMH: Attention Deficit Hyperactivity Disorder and for anxiety. Medications: Clomipramine, Fluvoxamine, and Lisdexamfetamine, There had been no recent changes in dosing or frequency. Allergies: The patient had no known allergies. Review of Systems: Unable to obtain due to mental status change. She had a temperature of 97.4°, a pulse of 101 beats per minute, a blood pressure of 127/67, a respiratory rate of 20 breaths per minute, she maintained 99% oxygen saturation on room air, and her weight was 59 kilograms. She was well developed, well hydrated, but somnolent and slightly disheveled. Her head was normocephalic and atraumatic. Her right pupil was 4mm and sluggishly reactive while her left pupil was 3mm and briskly reactive. She had a right gaze aversion on repeated exam. Her conjunctiva, however, were normal in apperarance bilaterally. The remainder of her exam was within normal limits. On neurologic examination, she had a best GCS of 10 (her eyes opened only on command, her speech was aphasic and largely incomprehensible, and she withdrew to painful stimuli). She remained somnolent with inconsistent participation during examination. With regards to her motor function, she had 5/5 strength in her left upper and lower extremities both proximally and distally, while only 2/5 strength in both right upper and lower extremities. Withdraw to painful stimuli was elicited in all extremities except the right upper. She was found to be hyperreflexive on the right with mild clonus and an upgoing plantar reflex. She did maintain normal and intact deep tendon reflexes on the left. While in the emergency department, stat laboratory studies were obtained including complete blood count, electrolytes, liver function panel, venous blood gas, serum drug screen, serum ethanol, acetaminophen, and salicylate levels, a urinalysis, and a type & screen. All of these studies returned largely unremarkable. She received an electrocardiogram which revealed nonspecific ST wave changes with occasional T wave inversion, but no QRS abnormalities or QT changes. 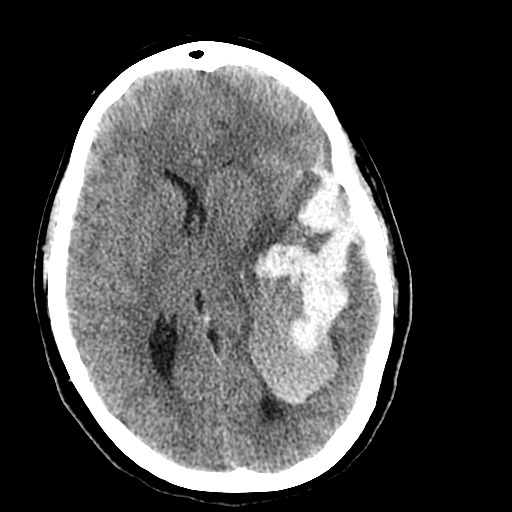 In addition, she underwent noncontrast head CT scan which revealed a large left temporal and parietal lobe hematoma with surrounding edema and moderate midline shift. There was question as to whether early potential left uncal herniation was present. Figure 1. Figure 1 shows the noncontrast head CT obtained while in the emergency department. 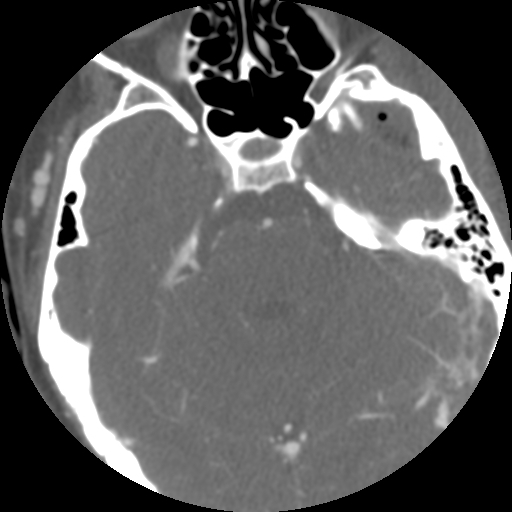 Findings of a large left temporoparietal parenchymal hematoma with subarachnoid hemorrhage along the left sylvian fissure in addition to edema and midline shift. Due to the patients’ status with regards to the CT scan findings, immediate intervention was taken to reduce intracranial pressure including; elevation of the head of the bed, administration of mannitol, and seizure prophylaxis with Levetiracetam. In addition, a stat neurosurgical consultation was obtained and the patient was assessed in the emergency department. 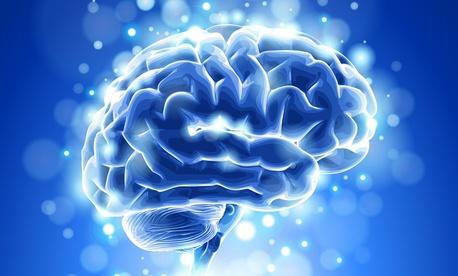 Based on their findings and recommendations, an operating room was prepared for emergent neurosurgical decompression. During this time, a CT angiography was ordered to evaluate for an arteriovenous malformation. Our colleagues in the pediatric critical care unit were called and briefed about the patient. Just prior to being taken to the operating room, CT angiography was obtained which revealed a normal circle of Willis without any evidence for arteriovenous malformation or aneurysm. The patient then proceeded directly from CT scan to the operating room. Following this neurosurgical intervention, the patient was admitted to the pediatric critical care unit where the final diagnosis was made on the second hospital day. Post-operatively, she remained largely somnolent but still arousable. Her pupils were 4-5mm and sluggishly reactive bilaterally. Her extraocular movements were intact bilaterally without further evidence of gaze deficit. Neurologically, she was sedate but able to follow simple commands. She displayed a symmetric face. There were purposeful movements appreciated in the left upper and lower extremities, however no such movements on her right side. She maintained intact sensation to light touch in all her extremities however she noted reduced sensation in her right lower extremity. Her right upgoing plantar reflex persisted, but no clonus was appreciated. On post-operative day 1, the patient was taken for a CT venogram, which revealed the final diagnosis. 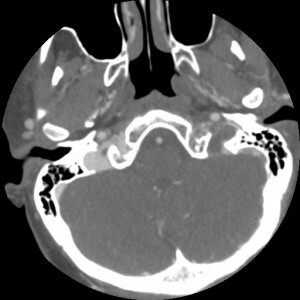 A thrombosis of the left transverse and sigmoid sinuses extending into the proximal left internal jugular vein was revealed. Thanks to Dr. Adam Kochman, who kindly provided the case and images. Dr. Kochman is Senior Fellow in the Michael Altieri Pediatric Emergency Medicine Fellowship at Inova Fairfax Hospital. His address is below. Previous PostSurround Yourself with Artists.Next PostShould you do a Pediatric Emergency Medicine fellowship? Great case! This is a diagnosis I consider far more often in my adult patients than I do in my teens. Especially challenging as it was impossible to quiz the teen without the parents on her first presentation. Drives home the point that any teenage female should be asked specifically about contraceptives (and perhaps her parents too….individually).